Where to stay in Porto? If you're looking for a place to stay for a vacation or short city break OportoApartments.com offers quality Oporto apartments for short term lettings and holiday rentals right in the centre of the city. Online bookings of these unique and quality apartments are sent immediately and directly to the owner. Please enter the dates of your stay to check the availability of all our apartments or use the links on the right to filter your choice. NOTE: 10% discount for stays of 7 days or more! Located in a refurbished historical building with a beautifully restored edifice, the StayIn Oporto apartment offers self catering accommodation for up to 5 guests. 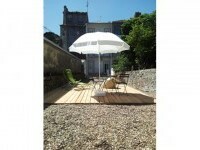 With free wi-fi, a well kept garden and bike hire for exploring the city. The apartment has been decorated in a unique, colourful and artistic manner. Located a short distance from many of the tourist attractions and Metro station. 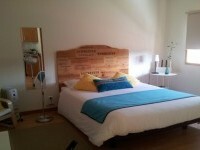 OportoApartments.com wants to make your stay in Porto both comfortable and fun. Our self-catering accommodation could not be better located, in the heart of Porto city centre, in the main tourist areas of Baixa, Boavista, Foz, Ribeira, Sé and elsewhere. We also have apartments situated in the current cultural centre of Porto near the famous Casa da Musica built when Porto was European Capital of Culture in 2001. We have cosy and romantic studios and stylish 1 bedroom flats, spacious 2 bedroom, and larger 3-4 bedroom apartments for families or groups. 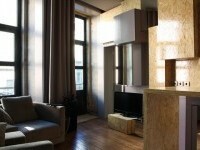 There are also apartments located in the same building which can be booked out for large groups. If you're looking for apartments with the artistic vibe and sense fashion of which Porto has become renowned for, then we certainly have those! Many of our apartments have there own unique sense of style and design. From modern and quirky to 19th century luxury the apartments in Porto have that sense of artistic creativity that has blessed the city of Porto since its time as the European City of Culture. Porto, with its increadible history and unique architecture is a great place for short-stay vacations, weekend city breaks as well as long stay holidays. .There is much to see and do in the unique city of Porto. In recent years UNESCO has recognised the historical centre as a world heritage site, centuries of architectural styles from Gothic, Baroc, neo-clasic, to romantic sit side by side in this enchanting city. There are many historical monuments to visit such as the Igreja dos Clérigos church and the adjacent Torre dos Clérigos, St Bento da Vitoria monestary, and the Church of Vitoria. It is also a great place to take some time out and just sit on an esplanade and take in the centuries of history surrounding you and watch the boats runup and down The River Douro that runs through the magestic city of Porto. And of course while in Porto make a visit to one of the many famous Port wine cellers! .For more information about the apartments for short breaks please just click on any of the apartment names or city areas above. If you prefer, you can use the search box to find only those apartments available for the dates of your stay, or choose the number of bedrooms you require. If you can't find a suitable apartment, of have any questions, please just contact us. We know many Porto apartment owners locally and can often find you a place to stay even when other sites show no availability.